NetBox Review 2019: Is NetBox a Good Hosting? Netbox provides a stable and high-quality web hosting service based in Norway. 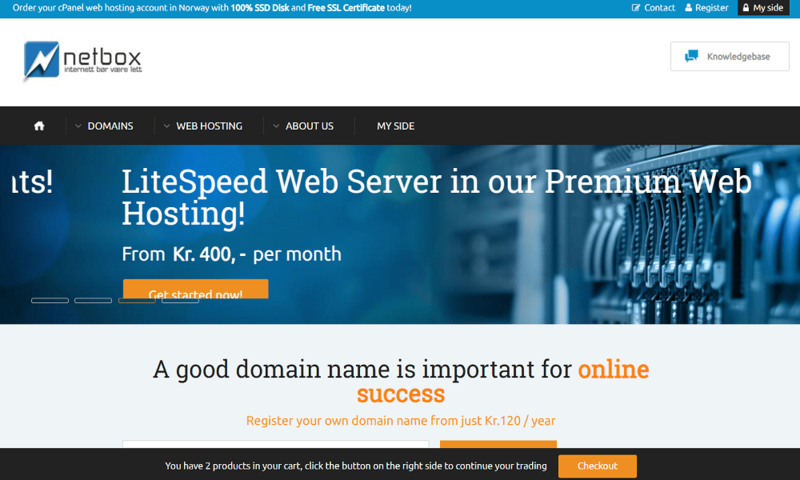 With their products, you’ll have access to some of the best web hosting platforms and software. Netbox is a Norwegian-based web hosting provider and one of the top providers within the region. Their products and features are geared towards making their customers’ web hosting experience as comfortable, user-friendly, and modern as possible by making use of the best third-party platforms. They recently added managed dedicated servers to their line of products. They boast reliable uptimes and fast speeds. cPanel: cPanel is the simply the most popular web hosting manager that’s both simple and powerful. It’s included with all web hosting plans. LiteSpeed: LiteSpeed is a server technology that was designed to make server hardware perform faster and is used on all Netbox products. Softaculous: Softaculous is a platform that always you to easily install hundreds of scripts with extra features on your web hosting platform. It’s easy to sign up with Netbox because there are almost no upsells and they will help you with migration. Because you have access to their own website creator as well as any of the most popular website management software tools, you should be able to manage your website in a way that’s easy for you. cPanel is also the most popular hosting manager for good reason. Web hosting: There are four plans that offer between 1 – 50 GB of SSD storage as well as 2 – unlimited domains, databases, and FTP accounts. All plans include unlimited subdomains, traffic, and email accounts as well as access to the most important features like Softaculous, backups, and their website builder and website management software. Premium web hosting: Premium accounts are similar to the standard web hosting accounts but with much higher amounts of storage and RAM and no limits on the other features. Managed dedicated hosting: Your dedicated hosting solution will be managed by a dedicated technician that will look after its health. These servers also run on superior Intel Xeon hardware. You can contact them for a custom solution if you have extraordinary requirements. Keep in mind that you will need to purchase a top-level domain but will receive a free SSL certificate with all purchases. Support is slightly limited with only an email and a Norwegian phone line. However, their dedicated managed hosting staff seem to be very diligent at maintaining their clients’ products as there are rarely any issues. It can take a few hours to get a reply via email but the staff is usually cordial and helpful. If you’re based in or serving an audience predominantly in Scandinavia or the EU, Netbox is a solid web hosting provider. Their packages include modern and very popular web hosting software like WordPress, Softaculous, etc. without being too expensive. Wondering how NetBox stacks up against other Web Hosting companies? Enter any other Web Hosting company and we will give you a side-by-side comparison.